Bryan and Bets returned from trip #1 to Glacier Park quite early in the morning. Naturally, the remaining morning was passed while we chatted about their trip and our experiences “home alone” over several cups of coffee. Meanwhile, the localized fog receded towards the ocean and left us bathed in some glorious warm sunshine. Maybe the weather was pleased to have the locals back and had arranged its own welcome. About an hour north of Tomales lies Armstrong Redwoods State Reserve with, we understood, some pretty impressive giant sequoias. We loaded up our stomaches with pastrami sandwiches and the car with our camera bags and walking shoes and headed up highway 1. Our route took us past Bodega Bay and up to the mouth of the Russian River where we cut inland along the river to Guerneville. A quick pause in Guerneville for another flea market (wallets again mercifully unsullied) and we were soon parking just outside the gates of Armstrong at the visitor centre. Being the weekend, it was quite busy but, once walking on the trails, the population was sufficiently sparse for the walk to be peaceful. We chose an approximately 3.5 mile route up the East Ridge Trail, back down to the valley, up once again on Pool Ridge Trail before descending again to see the “Colonel Armstrong Tree” prior to our feet breathing sighs of relief at being allowed to escape the confines of our walking shoes. Blissful memories of the dry walking conditions we experienced in Crete: how pleasant it is for ones walking shoes to be covered in dust rather than caked in mud at the end of a walk. The climbs up the trails here proved to be shorter, sharper shocks than the climbs we did at Bear Valley. After making it up a couple of climbs of 500 feet or so, thinking that we had done enough, we were rewarding by achieving what I imagine to be the main goal at this park. 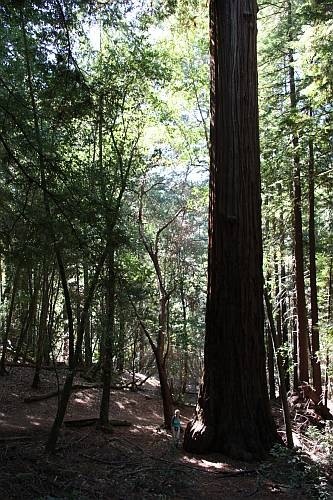 The Colonel Armstrong Tree turned out to be a 308 feet tall sequoia. No amount of manoeuvring with our lenses was going to show anything but its trunk, such was its situation. Other equally impressive trees in the plantation were better situated, though, and proved more fruitful. 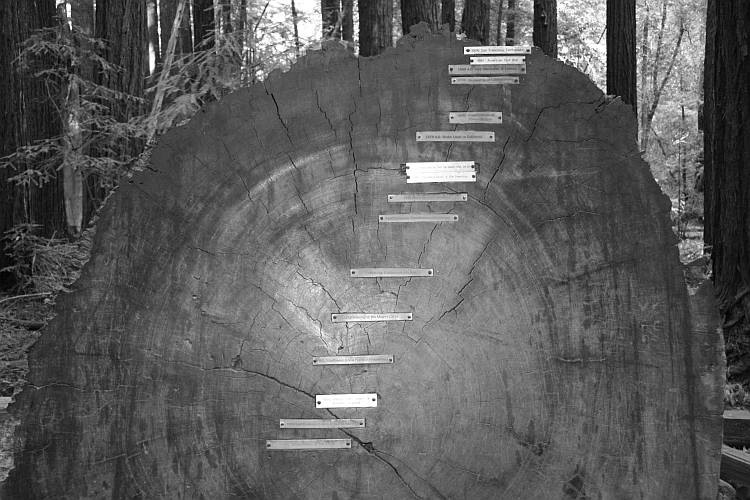 Towards the end of our visit, a cross-section through the trunk of one of these giants graphically demonstrated its age with plaques remembering various events in history. Having visited Dives-sur-Mer in Normandy earlier this year, I was intrigued by the third plaque from the centre of this tree which reads, “1066 – William the Conqueror invades England”. Dives-sur-Mer was his port of departure. The outer plaque reads, “1906 – San Francisco Earthquake”. This tree was a relative junior, though; the age of the Colonel Armstrong Tree itself is estimated at 1400 years. That is a truly lovely & impressive tree, thanks for being a scale pointer, Carol. Ok – how do you know that one is the Colonel and is 308 feet tall? Did you do that bit we were all taught in school whereby you view it through your legs etc etc?